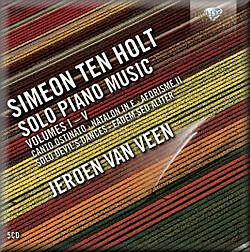 Following on from Jeroen van Veen’s remarkable Minimal collections, the second box of which I looked at in 2011 (see review) and the Brilliant Classics Simeon ten Holt multiple piano works 10 disc set 7795, we now have as substantial a collection of his solo piano music as one could wish for. Ten Holt died in November 2012, in the month just after this recording was completed, so what might have been a celebration has become something of a memorial – but what a stunning memorial it is. Canto Ostinato was originally written for solo piano but became famous in its version for four pianos, the CD recording of which still involves changing discs twice in the duration of the piece (see review). This activity always reminds me of having to change 78rpm record sides halfway through a Mahler symphony movement, and while the four piano version has its distinctive merits it has to be admitted that this is the kind of piece about which you can probably say enough in a little under 80 minutes, certainly with solo piano. I will avoid the bewildering array of versions of this piece now floating around, including a rather nice one on harp, but of the solo piano versions that with Ivo Janssen on the VOID Classics label might have been a competitor if Jeroen van Veen wasn’t so very much preferable. Van Veen’s lightness of touch and sense of colour with the keyboard draws you in and holds your attention, fascinated at the chilly dissonances Satie-esque harmonies and resolutions which pass us by like the changing shadows as the sun rises. Janssen is heavy and relenting by contrast, and a big turnoff in my opinion. Jeroen van Veen has lived with this music in its various guises for a long time now, and knows where to find its sense of fun and sparkle. Under his hands these notes are ripples of reflected light on water, not hard-hitting minimalist statements. Canto Ostinato will be a big draw for purchasers of this set, but the other works are equally and sometimes even more interesting, putting Ten Holt’s popular masterpiece into context as well as fleshing out our awareness of his wider output. The Natalon in E is a five movement suite or sonata, with some ostinato elements but is essentially in a sort of antique style which Mozart might have found familiar. I first heard this on Kees Wieringa’s 1987 recording on an obscure Clarison LP together with the Cyclus aan de Waanzin, which has I believe since been released on the Do label. Wierenga’s playing is very good, with a greater sense of drama and a swifter more driving tempo in the finale, but Van Veen’s recording wins through greater transparency of sound and some truly beautiful moments, such as with the sublime penultimate Lento sostenuto. CD 2 concludes with a première recording of the sweet little Aforisme II, which dates from a few years before the Canto Ostinato and other extended works, but pre-echoes these in some of its harmonic progressions. The meat of this set is to be found in the Solo Devil’s Dances, of which the second occupies the entirety of CD 3. This was originally written for orchestra, and is a real tour de force for the pianist, with its complexities in terms of shifting accents and rhythmic subtleties. Van Vann, with typical understatement, suggests that these pieces require “a well-trained pianist.” To my ears they require a pianist blessed with a mind like a planet and wrists of steel, but Van Veen’s performance once again brings out music with an uplifting sense of joy, like the essence of a life spent in carefree dancing on clouds. This is indeed minimal music, but is so very far removed from the mechanical that you tend to forget this aspect of its creative impulse. CD 4 takes us further down this path, with Solo Devil’s Dance III, which bustles like busy conversations in a crowd speaking in notes they were handed down from Bach’s workbench. The earlier Solo Devil’s Dance I is short and more of a scherzo around limited intervals or scales, with Van Veen entertaining our minds through Ten Holt’s remarkable two-part inventions. CD 5 brings us Eadim Sed Aliter, which translates as ‘the same, but in a different way’. This we are told uses a simple chase technique, the part of the left hand shifted two sixteenth notes from the right, “resulting in a perfect patchwork where all the sections are connected.” The micro-details of accents and rhythms coupled with those extended harmonic shapes and dynamic arches make for another mesmerising and fascinating listen. The finale of the set is the Solo Devil’s Dance IV, which is the one most closely associated with the ‘Diabolus in musica’ or tritone interval. Running at a punishing speed throughout, this is another genuinely spectacular piano marathon, but again with Van Veen’s illustrative subtlety and lightness of touch to guide us through Ten Holt’s at once intense and intensely open notescape. There are many ways of listening to music, and the longer of these pieces are illustrative of the kinds of work which can take us on a journey – most particularly an inner journey of the imagination, in which the mind is active but clearly being led by the hand of another in a specific direction. In this case, the direction is almost always one which moves towards light, which is positive and life-enhancing. This is thanks to Simeon ten Holt’s musical vision, but is also due in no small part to Jeroen van Veen’s remarkable and sensitive interpretations. This whole experience can all be yours for just little more than the price of a single full-price release. Well, what’s keeping you?